We all love our grannies, especially if they were that cool. 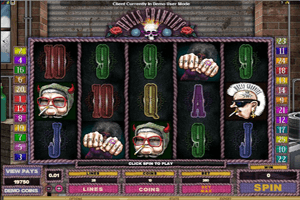 This Microgaming game allows you to join the exciting company of a group of grannies who did not want to spend their life in a nursing home or sitting at home. Instead, they gathered a group and created the first ever granny biker gang so they can travel the country and enjoy their time. The symbols that players will see landing on the reels after they place the bets and spin the reels include a knuckle tattoo, the Hellsgrannies logo, a bike, writing on the wall and the different grandmothers of the hellsgrannies bike club. The writing on the wall “Knit Fast Die Warm” symbol is the game’s joker, which means that whenever it lands anywhere on the reels, it is going to replace other symbols on the paylines in order to help create a payable combo. Only the highest payout possible will be paid when the wild symbol substitutes for another. It will also double the regular payout that can be found at the paytable of the game. The wild icon will not substitute for the scatter icon which is the Logo of the bike club. This scatter icon gives out scattered payouts and it will also trigger the Spin it to Win it bonus when 3 of these logos appear scattered in any locations on the reels.